Discussion in 'Learning Techniques and Advice' started by Josu88, Jul 14, 2015. This forum is a big source of materials and information about language learning. In order to contribute to this forum Im going to talk about how i learnt Russian language myself from home and from scratch. I went from zero level to fluency in a period of 2 years. (by fluency i mean B2 level, i passed the exam). Please note that im not an English speaker so maybe some parts of my method wont suit you, also I consider it to be a tough program and it requires discipline, at least 1 or 2 hours everyday (many days i woke up 90 minuts earlier on the morning in order to find time). 3) You can use extra grammar books on the internet, or some webs with audios of letters to get the right phonetics, as и is not the same like ы. or T doesnt sound like TЬ (even if at the begining sounds the same for you, you need to pay attention listening this sounds many times in order to see the difference and to pronounce it yourself correctly later). 1st day: Read and listen many times dialog of lesson 1, (and also read the grammar notes). 2nd day: Read and listen lesson 2 (with notes) many times, but also come back to lesson 1 and read it out loud, trying to repeat the voice and entonation of the russian speaker the most acurrate possible. 3rd day: read and listen lesson 3 (many times). Repeat out loud lesson 2. And lesson 1 you have to read only the translation text in your native language, and say out loud the translation without looking at it, comparing with the original text to see how many mistakes you have. (i was reading in Spanish and pronouncing out loud Russian, after every sentence i pushed the PLAY button to listen the native voice and compared if i said right). Many times were mistakes , but the good thing was i could notice them, and everytime they were less and less. Note: many people doesnt like to read out loud alone, but i found it extremely helpful, many times you think you know words but is not until you make this conection voice/brain that is not completely active vocabulary ready to use. So i recommend you to dont be lazy and read out loud, so first time you will talk with native speakers will be ten times easier. 2nd phase: EXPAND YOUR VOCABULARY/GET YOUR VOCABULARY ACTIVE. -Shared talk (good to chat with text). Begin with this as you can use translators to help you. - Italki (good for talk by skype). I didnt use it to pay for lessons with tutors or teachers, i just used it to find friends and make exchanges, where we choose topics and we talk some time in Russiand and in return some time in Spanish. I think private tutors are only necesary in order to answer specific questions or some grammar things you still didnt get from assimil. At begining conversations were hard and was extremely difficult to express myself, dont worry its a normal process. In order to continue improving and knowing more words, assimil and talk is not enough, you need more and more imput regularly, for this my fauvorite resouce is LINGQ. With lingq i read and listen a lot, everyday i traslate 1 or 2 texts on morning and i listen them on my iphone many times during the day, on the metro, while i wash dishesetc. So that makes the constant circle where you have to be getting constant input from Lingq, and producing constant output talking with native speakers for free on Italki.. Many times you gonna have to come back to grammar books, and check some notes, watch youtube videos about grammar or phraseology, but most of the time you will be listening interesting material and talking to interesting people which is the nicest part of the process. When you are at this point you just have to continue doing this for 2 years, yeah 2 years doing it everyday for 1 or 2 hours is the only way i found to reach fluency, i dont think there is any shortcut. During this 2 years will be some psycological crisis, times where you have the feeling you are not improving etc, but its normal, you just have to keep going and some day you will find yourself watching a tv show and understanding everying when you talk with friends in Russian. I hope my experience will help somebody. Thank you for you attention. Thanks Josu. Did you take the B2 test in your own country? The B2 exam requires cursive handwriting - how did you prepare for that? Im currently living in Russia, so the exam i took is not the official for foreigners, is the exam that Putin decided to put for inmigrants in order to stay in Russia. I applied for the permanent residence permit, in which you must pass the exam with more than 80% acurracy with reading comprehesion test, listening test, grammar test, oral talking test, history, laws, and also writting. About the written test i had in my case it was to write a letter to the director of a school, in order to put my own kid studyng there (very stupid test by the way). i had the possible variants of written tests thanks to a friend , and i prepared that beforehand. I bought the books that teach you cursive step by step, in Russia are very easy to find for kids, also in internet they must be easy to find if you write прописи. And i wrote that letter many times declinating the names with кого кому and all the stuff. I must recognize that writing is the hardest with al miagky znaks and all that is very easy to confuse, i know many people who have a flawless Russian but they cant pass any oficial exam because of the writing. Besides passing that exam for inmigrants i did a test in a private school (i didnt have any intention to pay for classes but i wanted to know my level), and they rated my level as B2, but i guess my writting skills would only allow me to pass b1 maximum. 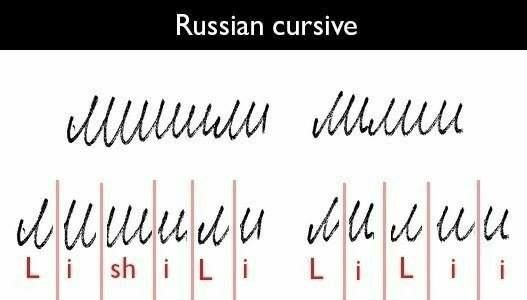 By the way, writing cursive is so hard because many letters looks the almost identical, like м л и ш ч ц etc. They are written just like "mountains" or "uuuu" and you have to pay extremely attention in to the connections between one letter and the other (for example М or Л usually have one conexion like a little tail at the end or begining of the letter that for example Ш doesnt have and thats how you distinguish them. I dont know how to explain good, but in real life not everybody respect this conexion of letters rules, everybody write how they want and is hard sometimes to understand cursive letter. Very interesting. Thanks for the explanation. The Russian "l" has a hook before it that helps to differentiate the letters in handwriting, but these words lishili and lilii are hard to read. Another point, however, is that the letter "sh" can be rendered clearer by drawing a line under it. If that is done, the word becomes much easier to read. I don't think that russian handwriting is the thing to worry about, a haven't seen handwritten documents for years.. Everybody use computers and printers nowdays and most of russian handwriting is readable quite well. I don't think that you, being in russian speaking countries, will find such complex handwriting in your real life.